Guests: City staffer Colin Simpson from the cycling group, and consultants from McCormick- Rankin: Kimberley Hunton; Meghan Whitehead. 1. Presentation re: segregated bike lanes. Colin Simpson, City of Ottawa; See power point attached. They are open to receiving comments to the end of June. 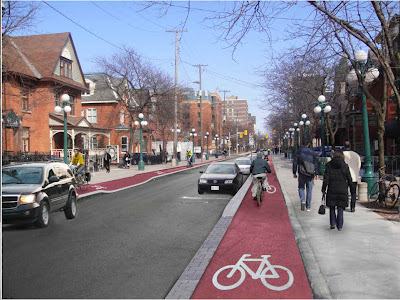 www.ottawa.ca/bikelane. Members had questions re: effects on business; on neighbourhoods; parking losses. 2. Adoption of minutes, with corrections to spelling of Michael and Charles’ names. Adoption: moved by Charles A., seconded Ida H.
3. Elections for the board: David Seaborn reviewed task of each position. Vice President: Charles Akben-Marchand, volunteered, acclaimed. 4.Secretary of State fund: About $1000 left over from co-sponsorship of Harvest Moon festival many years ago remains as a separate line item in the accounts. Eric moved that be rolled into general fund, Catherine Boucher seconded. 5. Pay and Display machines: the city will paint green dots on Preston and on Somerset where machines will go in. City wants our feedback when dots have been put in as to appropriateness of location. Some parking meters will be converted to 500 bike racks for whole city. Eric to ensure there is not a pay and display machine in front of the Somerset garden. Grace Xin, CBIA, has asked the DCA to handle the pay and display coordination on Somerset.Eric and David to do so. Ida moved, that DCA express displeasure that we are not getting equivalent bike racks to parking meters being removed. Essentially more bike parking is required. Seconded Charles, all in favour. Eric to write letter. Problem of parking on side streets raised. 6. Bell St.Towers: a new look to Bell St. Towers is coming. There is a request for a minor variance for three roof top units to be added.There will be about $40 million spent on repairs, including a new facade. The builder wants a sign variance to hang very large banners for five to ten years. Eric will write short letter objecting for excessive size. Landlord has indicated that no one will be evicted because of the renovation. 7. Zoning at 73 Aberdeen. Between Preston and O-Train, on north side, to allow for artist studio, and now asking for re-zoning. Any home can have home occupation, as long as only one client at a time. DCA will object to expansion of commercial into residential. Eric will write letter. 8. The NCC loop idea for interprovincial transit is apparently back on the drawing boards. The position favoured by the DCA is to use LRT across Prince of Wales into downtown Gatineau. We will take every opportunity to ensure opposition to buses (STO Rapibus) using the Prince of Wales railway bridge to a terminus in Ottawa on the Flats. 9. Claridge requested 2-4 floors more for their next building on Duke Street on LeBreton Flats. We opposed the height increase, the City has approved this, it has essentially gone from 4 to 8 stories. 10.Public Advisory Committee for Bronson reconstruction: Consultant has set agenda thus far (all focus is on moving more traffic), now the community needs to begin to set agenda. An engineering drawing of the existing conditions on Bronson to be made available to DCA through the Councillor’s Office….Queen St. to Queensway. Charles’ suggests that DCA and CCA have its own mini-open house with other interested folk. Laura will speak to Diane about possibly hosting a meeting. Bore holes for underground transit being done…geo-technical and environmental. 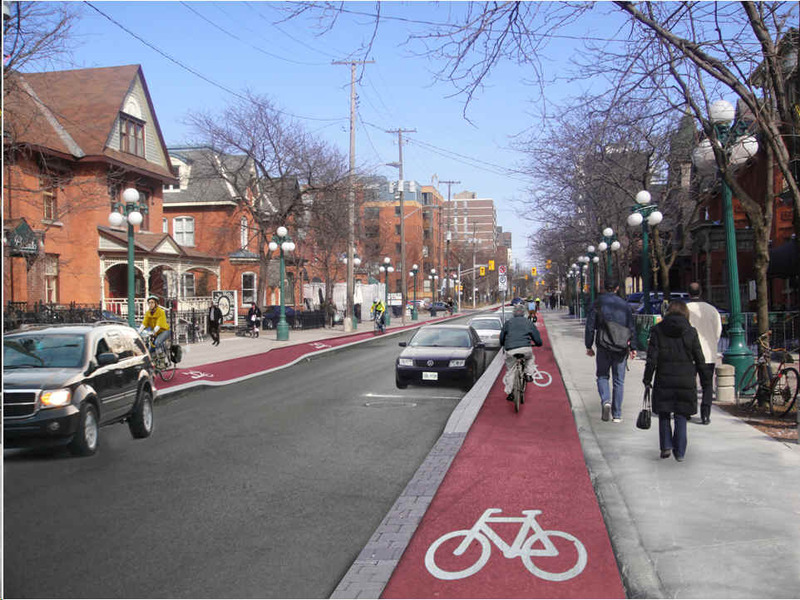 Consulttion on segregated bike lanes scheduled on May 26: Eric and David to attend. Urban design guidelines, meeting on Thursday May 13. 7:00pm. Pubwell’s applying for outdoor patio space. Discussion. All patios close at 2300 hours. Eric will send comment re: concerns about the noise. Lively debate. Booth St. curb extensions (bulb outs) are up for construction this season. David S will make comments to the city regarding the road width size (be consistent), our preference for bollards over “tiger tail” sign panels, and the desirability of trees on the bulb outs. 12. The Buzz is jointly owned by DCA and CCA: Board is made up of 2 members from each CA and chair of CA or his designate is exoficio; Jack Purcell has one member; as does CCOC and PPRA, SWCHC or CCHC, and rep of local BIAs..
Ida Henderson has resigned as PPRA from the BUZZ board when an article on the Israel-Palestine issue was not accepted. There ensued a discussion of editorial policy and what articles constitute local interest/local connection to national and international stories. Policy of BUZZ is being re-focussed to ensure community relevance. Maija will remind CHC’s that they have one seat on BUZZ board and ensure one CHC article per month. I have to object to the opposition to re-zoning 73 Aberdeen. The argument that it's in a residential neighborhood is kinda moot, seeing that it's across the street from the OpenText building, and next door to an auto body shop. Matt: some reaction to the proposal has to come from what we see there today, but a larger part comes based on what is planned for the neighborhood. The planning basis for neighborhood development is strong residential side streets abutting a strong main street. For aberdeen, the garage is a non-conforming use (other industrial users along the railway are busy planning residential redevelopments); the office building was built as a condo (thus how it looks...) and only at the last minute converted to office space. It might go back to condo, might stay office. We are also concerned about it being cheaper for people to convert housing to business locations and stores rather than locating along the main street. Everyone loses in that scenario.